The majority of people have computers. Most of those people have things to print . . . a lot of things. Despite the fact we hear so much about this becoming a “paperless society,” there are still millions of papers flying out of printers and copiers all over the world. That requires a hefty amount of ink and toner. Eventually that ink and toner will be used up and have to get discarded somehow. After all, when you run out of ink it’ll probably happen in the middle of a major document you need printed off at the last minute. What better way to vent your frustration than by chucking that cartridge in the trash? That may be the easiest and most convenient way to dispose of cartridges, but there is a better, cleaner way. Did you know that ink and toner cartridges can be recycled and are just as important in the recycling effort as paper and plastic? It’s rarely on the minds of most people; especially in the scenario above. The fact is that 97% of the materials in cartridges are reusable, thus making recycling the go-to option for disposal. There are several benefits to recycling. The most important one is that they’re kept out of landfills. Cartridges that end up in a landfill take thousands of years to decompose, leaving a giant carbon footprint (and ink and toner) on the earth. Remanufacturing a cartridge only takes 20% of the energy used as it does to make one from scratch. This translates to lower costs for purchasers when buying from companies that remanufacture the cartridges. If you still need an incentive to recycle your cartridges, consider this: a lot of companies pay you to give them your empties! This provides a great source of additional income for non-profits, businesses, and schools. If you only use a few cartridges in a year span and don’t want to hassle with the process of recycling, you can take the empties to a local store that accepts them. Many pack and ship stores like ours have programs to get the cartridges recycled. Throughout this post, we’ve used terms like “recycle,” “remanufacture,” and “reusable.” So what’s the difference between the terms? We went to InkGuides.com to get a better definition of the terms to share with you. Refilled: These are cartridges that have the ink put back into the original cartridge. This method is the quickest to get the ink replaced, but it does not mean the quality of the ink will be good. Eventually parts of the cartridge will wear down and you’ll have to buy a new cartridge. Refurbished/Reused/Remanufactured: This method is the one we’ve been referring to. Companies that perform this method take the empty cartridges and scrap them clean and wash them. If parts are missing, they reuse pieces from other cartridges to repair the damaged one. Each cartridge gets tested to ensure the OEM requirements by the manufacturer are met or exceeded. The advantage to this is very little waste is produced and more energy is conserved. Recycled: Made up of “reworked waste” or parts of old printer cartridges, this kind makes up about 20-30% of all cartridges sold. The cost to produce them is higher due to transportation and sorting, making it one of the least beneficial choices. Virgin: These are brand new, never-been-used cartridges. They’re made from raw materials, which requires a larger amount of energy to produce. Obviously this is the worst option and should be avoided whenever possible. Now you know the various types of recycling available for ink and toner cartridges. 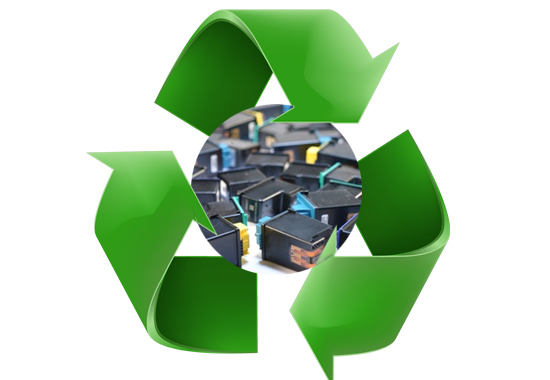 Recycling your old or empty cartridges helps everyone from yourself or company to the earth itself. Find the nearest location to you that recycles your empties and start seeing the positive influence you can have today. The earth will thank you for it! This blog is very nice its very helpful blog thanks for sharing…! !